This post was updated in July 2018 after my most recent Camino. 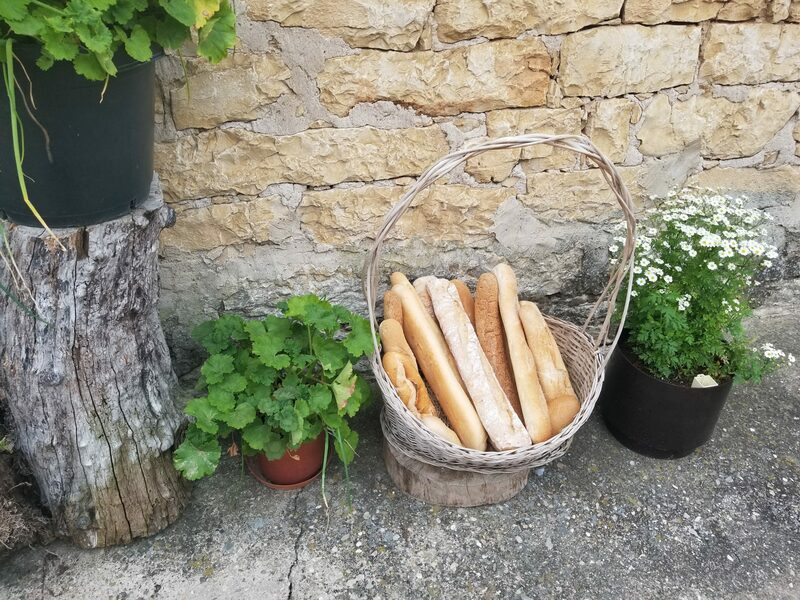 Along the Camino, most people do not carry much food. They rely on bars and food trucks to sell them with snacks along the way. This will strategy will not work for you, fellow person who cannot eat gluten! Toast is one of the most popular breakfast items. Sandwiches are what’s on the menu for lunch. Dinner was usually fine, but choices are limited. Luckily for us, wine is gluten-free! Here’s is how I made it through. Most of the time, you will be able to find tortilla de patata in the mornings and early afternoons. It’s mostly potato, held together by some egg. One time I even saw it where they made an “sandwich” by putting ham and cheese in between slices of tortilla “bread.” Brilliant. Tortilla always came with a piece of bread, which I usually gave away to other hungry pilgrims. But you could always order yours sin pan. As you get closer to Santiago, is much more difficult to find tortilla de patata. Instead, you will find regular old omelettes (tortilla francesa) or two fried eggs (huevos fritos). This didn’t really fill me up, so I would add bacon. However, we did find a grocery store selling canned lentils. After that, they became my go-to breakfast. These taste much better when they are heated up. But they are not too bad straight from the can. This seems so gross to type, now that I am not on the Camino. But after eating eggs twice a day for several weeks in a row — cold lentils may sound good to you too. I got so excited when I saw these snacks! Ready made lunches. I saw two varieties, either lentils or chickpeas. There is also one with tuna and vegetables. And they were not intended to be warmed up, so they tasted just fine on the trail. I bought a loaf of gluten-free bread in grocery stores when I could find it. If the restaurant staff seemed friendly, I would ask them to use my bread to make me a sandwich. I was so surprised that it actually worked! I got this idea from a Scottish woman with Celiac disease, who also brought gluten-free pasta to restaurants. I never worked up the nerve to try that one. I also carried rice cakes with me all the time. They were readily available in most grocery stores. I put jam and butter on it for breakfast. I put sardines, cheese or lunch meat on them for lunch. Everywhere you go, you will see pilgrim menus for lunch or dinner. They usually cost around 10 euros. There are two courses followed up by dessert, along with quite a lot of wine. I usually had soup, salad or paella for my first course. The second course is usually meat and french fries. The printed menu will not usually say if the meat is breaded or not, so it’s very important to ask. Sometimes, they also use flour when cooking the meat. Restaurant staff were always able to answer my questions about what had wheat in it and what didn’t. For dessert, you can usually eat the flan, yogurt or rice pudding. I did find that at least one popular chocolate pudding in Spain had wheat in it! So read those labels. Gluten free toast. What a dream. Itero de la Vega – La Mochila: Falafel. I ate it for two meals in one day. Enough said. Moratinos Bar / Hostal: THERE WAS GLUTEN FREE TOAST. You could put anything on it. Sahagun – Albergue de las Madras Benedictinas: There is a potluck meal in the evening. I made quinoa salad to share. They made sure to set aside some lentils and potatoes for me. Ferreiros – Restaurante O Mirallos: Gluten-free bread, cheesecake and other desserts. Our server was Celiac. Rabanal – Green Garden Grocery Store: They sell lots of gluten-free products. And will make you a gluten-free sandwhich with ingredients from the store for a very reasonable cost. The employee who helped me is Celiac. If know of any other places, leave a comment and I can add it! I used the excellent, free podcasts at Coffee Break Spanish to teach me how to order food, with a special focus on Lesson 18: Dietary requirements and allergies. I also focused on some particular food words, by checking out this gluten-free restaurant card. I have am allergic to wheat. This is a firm dietary restriction for me. I also am also mostly vegetarian at home, but I had to drop that along the Camino. Trying to keep up with both would have meant I had almost no options some days. No bueno. If you have any dietary restrictions that are preferences, I’d suggest being as flexible as you can. You’ll be much happier with more food options! Despite being extremely careful, I accidentally ate food that contained wheat several times. Sometimes I assumed the same type of food would be fine, as it had been fine several times before. It’s quite hard to have the same conversations about food allergies over and over again in a language I don’t speak very well. One time, I did not read the label of something I bought in the store, as it was always fine at home. I always carried the medication I needed to treat my allergic reactions. And I was glad I had them with me when I unfortunately needed them! What advice do you have for people walking the Camino de Santiago with food restrictions? Leave a comment below! A mi edad ya no puedo Hacer el Camino de Santago, pero motivará a otros para que lo Hagan. Debe ser para recordar siempre. I’m a celiac that is planning on doing the Camino this coming July for the first time. What kind of medication did you take after ingesting gluten? I’m very concerned because if I ingest gluten I get very sick & won’t be able to continue for a few days. Thanks so much for your article. It’s very helpful! I am allergic to wheat, so I carry an EpiPen and antihistmines. I’m not sure if there is anything for Celiacs! Sorry. Good luck!